The world's first automatic meat/bone separator was created by Stephen Paoli, inventor and separation technology pioneer. Paoli's quest to build a mechanical deboning machine began in 1953. His first commercial success was in 1964. That machine was the first Model 19, named in honor of the 18 models and half a million parts that preceded it. Paoli's original intentions were to make meat trimming an easier task and provide more edible animal protein for the expanding world population. While his intentions were being met, processors realized increased profits by expanding processing yields through recovery of product that was being lost to scrap, and they enjoyed savings in the cost of labor used in hand trimming. Paoli's almost relentless need for simplification led to Paoli "One-Step" deboners and desinewers which debuted in 1984. These ultra durable and dependable meat/bone separators contain just seven primary parts,only one of which moves. The "One-Step" machines are so durable that Paoli recommends that his customers do not stock spare or replacement parts. "One-Step" machines do not require scheduled sharpening or rebuilding. "One-Step" has eliminated the necessity of pre-grinding input in most circumstances; thus opening the way for small and medium-size processors to receive the yield and profit benefits of "One-Step" technology. "One-Step" deboning pointed the way for Paoli to concentrate on sinew removal; i.e. desinewing. Paoli "One-Step" desinewing is used by beef and pork processors wishing to upgrade boneless cuts such as shank into sinew-free chunky ground meat. When the bone is gone from turkey drums, Paoli technology recovers chunky ground turkey. Stephen Paoli thrives on meeting with potential customers. The inventor personally demonstrates his "One-Step" deboning technology live during the International Poultry Exposition (held annually evey January in Atlanta, Georgia, USA) and International Boston Seafood Show (Boston, Mass. March each year). He processes broiler breast carcasses and necks during the IPE and catfish frames at the IBSS. Show visitors are encouraged to stop, look at, listen and feel the results of Paoli "One-Step" deboning. His drive for simplicity and ease of use make the annual show demonstrations possible. Only Paoli demonstrates live during these shows. In addition to deboning and desenewing, Paoli "One-Step" technology is at the forefront of meat recovery systems. The Paoli "One-Step" meat recovery system rescues meat rejected through grinder bone chip elimination systems. Much superior to regrinding of BCE material, only the Paoli "One-Step" system removes incidental bone chips and sinew. High volume grinding operations of beek, pork and poultry have found Paoli meat recovery systems to be the answer for maintaining profit and quality. 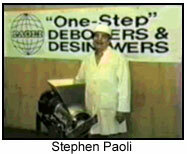 Stephen Paoli Manufacturing Corp registered as Stephen Paoli International Corp. to declare its market as worldwide. His machines are in operation in over 130 countries. Stephen Paoli's company is directed by the man who started it. Few companies last as long and even fewer have an owner who has met the test of time as well as Stephen Paoli. He expects to lead his company well into the next millennium.